i cover central London and most areas within the M25. Also parts of Essex and Kent. Overnight Postnatal Support, Birth Preparation Classes, Breastfeeding Support. Hello! I am an experienced Birth and Postnatal Doula, having attended over 35 births, and helped many people transition into the role of becoming new parents. I guess what I want to say first is how passionate I am about supporting women to have the births they would really like to have, whatever that means for them. This may mean having the confidence to stay at home (for a planned home birth) or just longer than they would have done otherwise if planning on a hospital birth. It could be that there is no other birth partner or that both of you would feel happier or more confident with the support of a doula. Many people hire doulas because they did not get the birth they wanted the first time around… I love nothing more than helping someone to get the experience they really want in a subsequent birth, including natural births after caesareans. I have two grown up children of my own (aged 23 and 26). I was a foster carer for many years and have been surrounded by babies and young children for most of my life. I had two very different births myself and two very different experiences of breastfeeding. I am not here to judge, more to align myself with what you want and be there alongside you. One of the things women find the hardest is sifting through all the different advice and information available on pregnancy, childbirth and parenting. I am a good listener and can help you make sense of what you have discovered yourself along with helping you find the latest research so that you can decide and align yourself confidently with decisions that are right for you. This may mean supporting someone wanting or needing a caesarean birth, including ‘gentle caesareans’. Many people underestimate the impact a new baby brings to their lives and can struggle with anxiety, postnatal depression or just coming to terms with a completely new identity and way of being. I offer comprehensive emotional and practical postnatal support, both day and night. Sometimes just a good night’s sleep can make the world of difference. I can also help with getting breastfeeding established. I am very happy to do whatever is needed, including light housework and looking after siblings… whatever is ‘on top’ or getting you down on a particular day is usually the best place to start. 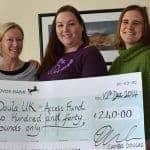 I have completed a comprehensive Doula UK approved training course with Kicki Hansard of BirthBliss Doula Services and my many life experiences help to make me a competent and caring Doula. ‘You showed me what I am capable of and for that I’ll be forever grateful’. ‘Thank you so much for supporting us all through a beautiful, calm and incredible birth’. ‘Thank you for your brilliance, kindness and talent in knowing exactly what to do to support the birth’. ‘There are no words to describe the gratitude I feel to you for your support and friendship during one of the most important times in mine and my family’s lives’. ‘Your presence and support enabled me to achieve the birth I could only dream of, and I have no doubt that I couldn’t have done it without you’. ‘Your help during the delivery was instinctive and natural and I didn’t even have to say very much’. Supporting Every Birth (focusing on supporting pregnant clients after a previous loss or current stillbirth).